In my mid-trip guest post for the TheVacationGals, I end by saying that a trip such as ours is not for everyone. That comment has bugged me since because I don’t clarify why I think this is the case. Firstly, let’s consider itinerary and transport. We have an intended overall itinerary for our each phase of our trip (e.g. China). We book transport as and when we need it usually on the spot in bus and train stations. (Truly last-minute airfares are not cost-effective for us even on budget airlines). First-class sleeper cabins on trains usually need to be booked ahead of time also, but just by three or four days. The first and probably most important reason why this style of travel won’t work for most people is time. If we were on a two-week vacation in Thailand, losing a day to travel from one end of the country to the other would be a big bite out our available time in the country. We’d probably fly. At the start of our trip we were surprised by how few Americans we met on buses and trains. It seems to me that time is a major factor in this. We meet plenty of Canadians, Aussies and Europeans, mostly on one or two month visits to a country and some with longer or indefinite travel plans. The American accents we do hear seem to be people who are on shorter trips, with flights as their primary means of transport in and around an area. (We don’t really cross paths with the younger backpacker set so I can’t really say whether this skewed population/representation statistic holds true in that group also). You cannot backpack as we’ve been doing if you like your creature comforts even when you travel. This rules out a lot of my own girlfriends (sorry, ladies, but it’s true). 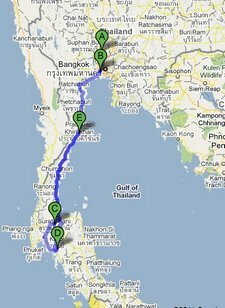 Take for example, our trip from Ayutthaya (an hour north of Bangkok) to Koh Lanta, an island in the Andaman Sea near the border with Malaysia. We left Ayutthaya at 8am so that we would be in Bangkok before the Chinese consulate closed (to pick up our passports with shiny new China visas) but our night train south didn’t leave until 7pm – that left most of a day to kill wandering around Bangkok. When we finally got on the train, it left and returned to the station three times before really leaving. The air-conditioned sleeper car wasn’t air-conditioned but there were fans. Things went downhill in a pretty major way when we got off the train (at Surat Thani if you’re checking the map). I’d paid for a connecting bus service which I was told would take us to the ferry-port of Krabi. Instead our bus took us to a remote “bus station” (those quotes are intended) where we were instructed to wait for another bus. The second bus was an OK coach. It seemed that maybe things were back on track until the bus stopped at the nearest town and loaded up with people – so much so that there was a person standing in the aisle between every row of seats. One poor girl almost had a panic attack at the thought of sitting on the floor – I think she was claustrophobic – so BigB offered up his seat to her (what a sweetie). Four jolting, sweaty hours later we were dumped at yet another out-of-the way “bus station”. At this point I was extremely pissed off that I’d trusted Thai National Railways to have a trustworthy coach service. We piled on our backpacks and started walking to the nearest town. It took us over 24 hours to get from point A to point B and it definitely wasn’t an easy trip. If you’ve made it to here, you may be wondering why I’m dragging out all this dirty travel laundry and how is this supposed to encourage anyone to backpack anywhere – especially with kids. Yesterday is a perfect example as to why all this extra effort can sometimes give stunning rewards. Quanzhou is not a small city, but I’m pretty sure, from the looks that we were getting as we hiked from the bus station into the downtown area, that western backpackers are not a common sight in this part of South-East China. We went out for an afternoon stroll in the busy center and stumbled into tiny backstreets with elaborate tea-rooms along an even tinier canal. 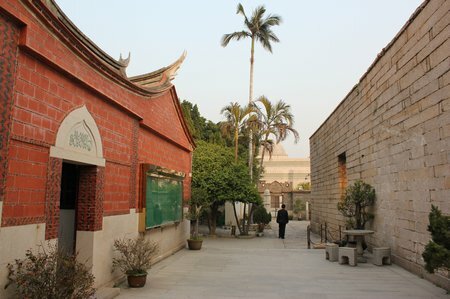 The reconstructed traditional, two-story, red-brick buildings with swooping tiled roofs in this area stood in sharp contrast to the modern city. We wandered into an antiques market filled with curios from old Chinese coins to early 20th century memorabilia. Coming around the corner we walked onto the forecourt of the 10th century mosque that we’d come here to see. A thousand years of history, of trade and human stories between two such diverse cultural traditions. This is why, for me, the effort to go off the beaten tourist path even when that effort can make you want to tear your hair out, is worthwhile. 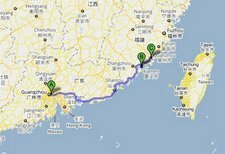 This entry was posted in China, International Escapades and tagged China, Fujian, Quanzhou on April 11, 2011 by wandermom. Great post Michelle! I felt that I was on the trip with you. Not sure I could handle the travel. I DO like my creature comforts. But what a thrill you must have had once you got there! And worth the trip!